3 stories, 3 different tales. UNRWA, where is the money going? In recent years, billions of dollars have poured into Gaza from hundreds of countries and international organizations. How much of that money has actually reached Palestinian civilians, effectively improving their quality of life and economy, has yet to be completely determined thanks to vague audits and on-line information. Only recently, with a relatively silent international press, have there been questions from top political leaders, primarily from US, about the way in which the donor money will be transferred into Gaza. At an Egyptian donor’s conference organized by Norway and Egypt in early March, more than 75 international donors and organizations met to announce their financial support of the reconstruction in Gaza. Over $5.2 billion were pledged at the conference, surprising the Palestinian Authority who originally called for $2.8 billion needed to build-up Gaza. By wrong hands, Clinton meant Hamas, the militant Islamist Palestinian party in complete control of the Gaza Strip. Over $300 million dollars of the US pledge money will be going to Gaza reconstruction, while the rest of the $600 million has been earmarked to Palestinian Authority‘s Mahmoud Abbas. However, there is another set of “wrong hands” in this scenario through which the transfer of funds may very well pass through, hands that are not considered a neutral player in the Arab-Israeli conflict. US State department spokesman, Gordon Duguid stated that Gaza support would be provided through USAID, in coordination with UN agencies that will most likely include UNRWA. UNRWA, the United Nations Relief Works Agency, established in 1949 to aid Palestinian refugees, has shown dangerous partiality to Hamas terrorists. UNRWA has employed several high profile terrorists which include top Islamic Jihad rocket maker, Awad Al-Qiq who was killed in an Israeli air strike last May 2008. Al-Qiq was the headmaster and science instructor at an UNRWA school in Rafah, Gaza. Another terrorist, Hamas’s interior minister and head of the Executive Force, Said Siyam, was a teacher for over two decades in UNRWA schools. Fox News recently reported that UNRWA does not ask its employees whether they are members of, or affiliated with, a terrorist organization such as Hamas or Islamic Jihad. UNRWA also offers no formal screening to ensure that its employees are not affiliated with terrorist organizations. During Operation Cast Lead, UNRWA officials accused Israel of firing into an UNRWA school, killing dozens of Palestinian civilians seeking refuge. Israel maintained that Palestinian rocket launchers locate next to the school had fired mortars on IDF soldiers, which prompted the army’s response. Later, UN official Maxwell Gaylord, reversed the UN’s stance stating that the shelling and fatalities had actually taken place outside of the school. But the media damage to Israel had already been done. of it from US taxpayers. The United Nations is to be supporting peace not war. Over 180 Palestinian rockets have been fired at Israel since the unilateral ceasefire began on January 18, according to the IDF Spokeperson’s Unit. The latest Qassam rocket attack targeted Ashkelon on Tuesday, March 24 after a 10 day lull. A Qassam rocket fired from the Gaza Strip hit the Ashkelon are on Tuesday afternoon. No injuries or damage were reported. Between March 17-24, three Palestinian mortar shells were fired at IDF forces operating along the border security fence. Hamas’s Izz al-Din al-Qassam Brigades claimed responsibility for the mortar shells fired on March 22. The last rocket attacks on Israel took place a week ago, on March 14, when Palestinian rockets slammed into the western Negev. The last rocket attack on Sderot took place on March 5, when a Qassam slammed into an open area in Sderot. Although Hamas recently condemned the Qassam rocket fire from the Gaza Strip, the rocket attacks have continued throughout March. Hamas stated that although it has fired thousands of rockets in the past, its military wing was not behind recent attacks. The militant Islamic group in control of Gaza also stated that it was actively investigating who was responsible for the rocket fire. On the day on which Israeli PM Ehud Olmert declared the ceasefire effective, January 18, Palestinian terror networks fired a total of 19 rockets at Israeli civilians in the south. Three of the rockets were fired after Hamas, Islamic Jihad, and other Palestinian networks declared a truce on the afternoon of January 18. A week into the ceasefire, one IDF soldier was killed and three wounded in a roadside bombing on January 27. Qassams, mortar shells, and Grad rockets have continued slam into Israel sporadically since the truce, with Sderot and western Negev residents entering bomb shelters between one to two times a week. On February 1, the first grad-Katyusha was fired at Israel since Operation Cast Lead, following two more Grad rockets fired at southern Israel on February 13 and February 21 respectively. 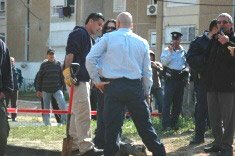 On February 28, nine rockets including two newly advanced Grad-type rockets slammed into Ashkelon. In what was the worst attack since the ceasefire, a Grad rocket slammed into an Ashkelon school, causing heavy damages. The Grad rocket tore through the school, after the air raid siren sounded in the morning, with shrapnel destroying several classrooms. Seven people living nearby the school suffered from stress-related trauma. The Ashkelon municipality was forced to shut down the school for sometime until repairs could be made. The Grad rocket that hit the school had a range of about 14 km or 8.6 miles, and was designed to cause massive damage. *Ha’aretz.com, Israel Ministry of Foreign Affairs, and YNet News contributed to this report. For the people of Southern Israel, there is no cease-fire, no truce. Yet the liberals moonbats cry that Israel must honor the cease-fire, the truce. Why aren’t they screaming for Hamas to do the same? One week ago I shared the human side of the conflict in southern Israel and told my personal stories from Sderot in a presentation at Depaul University in Chicago sponsored by StandWithUs, Hillel, and the university’s Political Science department. As a representative of Sderot Media Center, I traveled from Israel to explain the daily reality of rocket fire that has been plaguing the country for the past eight years. Still one week after I told personal stories of having 15 seconds to run for my life, because of the overshadowing anti-Semitic harassment and disruption caused by pro-Hamas student and non-student organizations my message of understanding and empathy for the people of southern Israel has not yet permeated peoples’ minds. I wasn’t 30 hours off the plane from Israel before I was greeted with more direct anti-Semitism than qassam rockets fired at Sderot. Several anti-Israel posters draped the entrance to the building in which I was to tell my personal stories. I began my presentation with a small audience of around 20 people and as my presentation went on the room began filling with people not merely against Israel’s political policies and action but people in clear support of the terrorist organization Hamas. When I welcomed the custom of a question and answer period following my presentation the very right of free speech that I welcomed to the audience of now over 100 people was thrown in my face and denied to me. To start the question and answer period, an audience member verbally attacked me, stated his support for the firing of rockets into Israel, and ended his anti-Semitic rhetoric filled rant with a question irrelevant to anything in my presentation. I then pointed out to the audience the same fact I want to point out in this article, that this person was not simply criticizing Israel but was clearly expressing his support for the terrorist organization Hamas. Before I could finish answering the question that was underneath all the threatening hate filled propaganda in this audience member’s statement I was interrupted and silenced by the overwhelming Hamas supporters. Next another audience member rose up in the front of the room and screamed out calling me a “dirty whore” in Arabic and proceeded to grab his crotch and scream “Here’s your qassam!” in Arabic. I am not surprised at the reaction from DePaul University. It is an established fact that the majority of US Collages and Universities openly support anti-Semitism and this rhetoric. In fact a student who is Jewish will get lower grades by the majority of their professors if it is brought to the professor’ s attention that the student is a Jew. It is chic to be an anti-Semite now on 99% of the campuses today. Documentation of this has become a goal of Gary Fouse of Fousequawk. I ask you, my reader to remember the people of Sderot and Southern Israel in your prayers. I am going to ask you to consider carefully what school you are planning to attend (or your child) and whether that school allows hate speech such as is seen in the video above and others that can be found on the internet. Do you want your child indoctrinated into Nazi rhetoric? Do you want your hard earned dollars supporting Nazi ideology disguised as sympathy for Palastinians? If you are an allumni of such a school and a supporter of Israel, why are you sending the school money to continue these activities? And like I always do, I will ask you to donate to the Sderot Media Center. Just click on the logo at the top or bottom of this post. It will take you right to the donation page. Now is not the time for people to be silence. Evil flourishes when good men do nothing!